This post may contain affiliate links. Please see my full disclosure policy for more details. As school winds down and summer begins, it's time to rest with my family and enjoy a good movie. 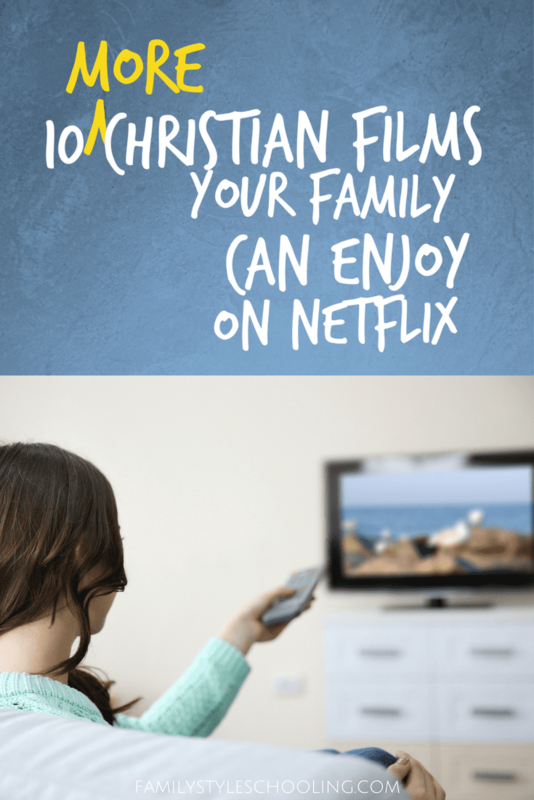 I've shared 10 Christian Films for your family to enjoy on Netflix, but there are still some more diamonds in the rough out there. Here are some more Christian films that we've enjoyed together! If something I've recommended doesn't happen to be available anymore, you can always check here for all of the Faith and Spirituality Movies. Lee Strobel's testimony in The Case for Christis truly inspiring. As a newspaper journalist, Lee Strobel works to disprove his wife's new found faith. When their daughter almost dies, the couple reacts in different ways. Strobel's wife seeks answers from Church, and Lee sets out to prove that faith is a hoax. Based on Strobel's best selling book The Case for Christ: A Journalist's Personal Investigation of the Evidence for Jesus, this movie is a fantastic representation of a investigative reporter putting his well-honed skills to work for the Lord. Netflix calls this one a "docudrama" because there is narration like a documentary, but the insight into the life of Martin Luther is brought to life through dramatizations of his history. This is a great intro to the life of a man with the first idea that went "viral" through the modern media of the time: the printing press. Often I struggle with Christian films because they center around so much tragedy. Having lived through loosing a loved one in a car accident, I feel very sensitive to that topic. That being said, these stories are powerful in exposing God's power to bring healing through suffering. I was skeptical of this one, but the story was a beautiful picture of how God brings people together in suffering to reveal His forgiveness, love, and power. So many people are walking through challenging circumstances. We need one another to walk through them. Get your tissues ready for this one! I really like Christmas movies all year long, and this is one of those that is worth watching any time of year. With a business in the red, Matthew struggles to choose between caring for others and caring for himself. When a young boy, CJ, helps him out in a time of need, Matthew's heart is warmed by CJ's belief in miracles. It's a sweet story of the power of community. Warning - this one isn't for littles. Written and produced by one of my favorite authors N.D. Wilson, this story explores the concept of gratitude and what life looks like without it. A young man, who is looking for his unknown father, waltzes into a small town and meets a young waitress and her grandfather. While this movie won't leave you with warm fuzzy feelings, it's worth watching as it will leave you thinking about gratitude and its connection with how we deal with circumstances daily. The Star has been one of my favorite Christmas movies for kids. It is such a sweet story that shouldn't just be reserved for December. I love the music in this animated tale. I grew up loving Benji, and now Netflix has remade the old family favorite and they did an amazing job. When a brother and sister walk in unexpectedly on a robbery and are taken captive, it's up to Benji to help the police track the kids down. I love the sweetness and loyalty that Benji shows even when he's kicked out of the house. Even though this one might be targeted for kids, I really enjoyed it. It's truly not just for kids to enjoy! Sometimes you just need to revisit classics like Highway to Heaven. They don't make them like they used to. Or you could enjoy the second spin-off of an old favorite: VeggieTales in the City. If you're truly hunting good Christian films, you might want to subscribe to PureFlix. There are some really good movies out there that exemplify Christian principles without ever mentioning God. So I have to ask, what makes something Christian? The Guernsey Literary & Potato Peel Pie Society is a historical fiction story based upon the lives of people that lived on Guernsey, a small island in the English Channel, during WWII. This small community comes together around books when that is the only way they can fellowship with one another in the German occupation. It is through these times together that they form friendships that carry them through difficult times. This movie is a beautiful picture of forgiveness and it presents a great opportunity for discussing Biblical perspectives on the challenges of war time living. Pelé follows the story of a young boy who fights his way out of poverty through his talent in his sport. Movies like this that show determination, rising from adversity, and singular focus present inspiring portraits of lives well lived. It is good to see how others live and be inspired to pursue excellence. I don’t consider myself over the top with what my kids can see but I’m definitely very careful with what shows and movies are allowed and Benji scared them to death and my girls are 11,9 and 7. The robbers are very frightening and my kids had to sleep in our room that night. I do So appreciate you informing us on these other shows and movies to watch! Just wanted readers to be aware of this Benji. Good to know! My daughter has been pretty sensitive, but this one didn’t bother her. It’s so hard to find safe options! Good post. I know about Netflix, this is platform to watch all christian movies, I will share a new platform: Crossflix, it is like Netflix, where you can watch christian movies, comedy movies, new movies trailers, drama and more. Wonderful! Thanks for the info! IS GENESIS HISTORY is no longer available on Netflix (9/2018) but is available for rent or purchase on Amazon streaming. Don’t Miss a Post…Subscribe to my weekly newsletter!